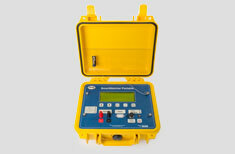 The PPS58 Combo SRO-Memory Gauge offers flexibility in gauge operations for customers who want to use the gauge in either memory working mode or surface read out mode. An SRO adapter is installed on the gauge to connect to a wireline cable head to be able to change the gauge from a memory tool to a surface read out tool. SmartView software is used for memory gauge applications and a PPS26 surface unit with PPS SRO software is used for SRO operations.